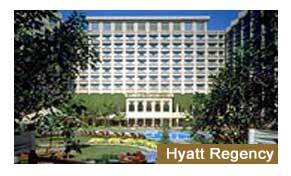 Hyatt Regency, New Delhi stands for elegant and luxurious accommodation. The hotel is an impressive local landmark and is tailor-made to provide both the leisure and the business travelers with all the comfort that is expected from a hotel of its class. An array of 508 exquisitely done up rooms and suites at Hyatt Regency, New Delhi are categorized into Presidential suites, Executive Suites, Terrace Suites, Regency club rooms, Pool facing rooms and Hyatt guestrooms. The slick rooms with its chic d�cor is also complete with a host of in-room amenities that comprise of Enhanced work desk lighting, Hairdryer, Minibar, Television, Dual line phones, Voicemail, high-speed Internet access, in-room safe, Coffee maker, Cable/satellite TV channels, Speakerphone, 24-hour concierge, Dataport, individual air conditioning control, Iron/ironing board upon request and morning newspaper. The dining needs of the guests are taken care of by the on-site restaurants. At La Piazza, you can sample oven fresh pizzas along with other authentic Italian bill of fare. Aangan is the Indian restaurant that offers traditional Delhi cuisine that is an exotic blend of more than popular cuisines namely Bania, Kayastha, Muslim and Mughal. TK�s Oriental Grill stands for a unique dining experience. It features seven hot grills where the skilled chefs cook for the guests who are seated around the grill. Seafood, lobster and prawns are served here with delicate sauces that are a treat for your taste buds. The Caf� is the poolside restaurant that impresses the guests with its elaborate buffet style breakfast, lunch and dinner. Hyatt Regency, New Delhi has found favors with the corporate guests because of the modern business and conference facilities that it offers. Be it a formal meeting, wedding or any other event, the state-of-the-art conference and banquet facilities will ensure that the event is a grand success. One can avail the latest business facilities that comprise of high speed wireless connectivity, projector, translation services, audio visual equipment and skilled technicians. Among the recreational facilities that one can avail are included the swimming pool, tennis courts, sauna, Jacuzzi, Steam baths, Club Olympus Fitness Center, Boutiques and Beauty Salon. Hyatt Regency, New Delhi feature an extensive range of additional facilities and services that include 24 hour front desk, babysitting service, car rental service, dry cleaning, laundry service, tour service, room service, travel services, currency exchange, concierge desk, luggage storage, cash machine, smoke detectors and safe deposit boxes. Indiahotelandresort.com offers online information on Hyatt Regency, New Delhi and other popular hotels in New Delhi.